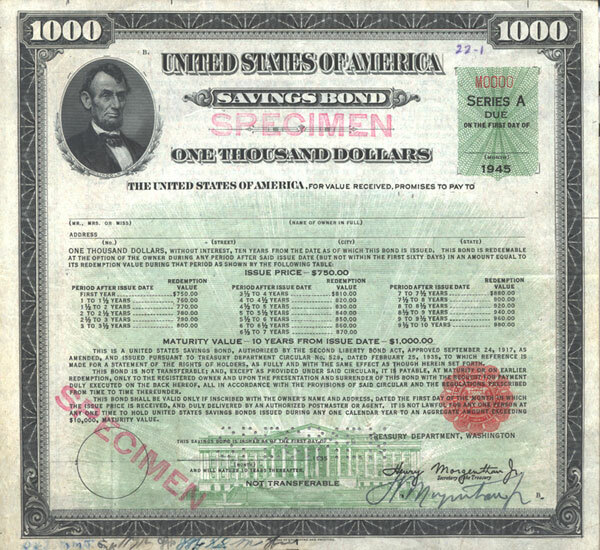 This history of U.S. Savings Bonds is rich with images that tell the story of our nation’s heritage. Click the milestones below to explore the evolution of savings bonds from their infancy through the Digital Age. 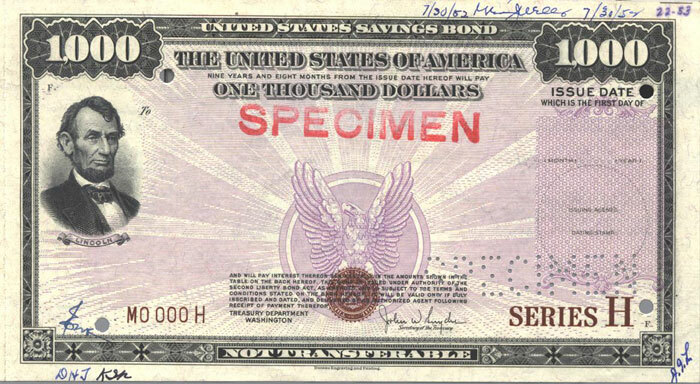 With the start of U.S. involvement in World War II in 1941, President Franklin D. Roosevelt announced the new Series E Defense Savings Bond – known informally as Defense Bonds – to finance the war on April 30. 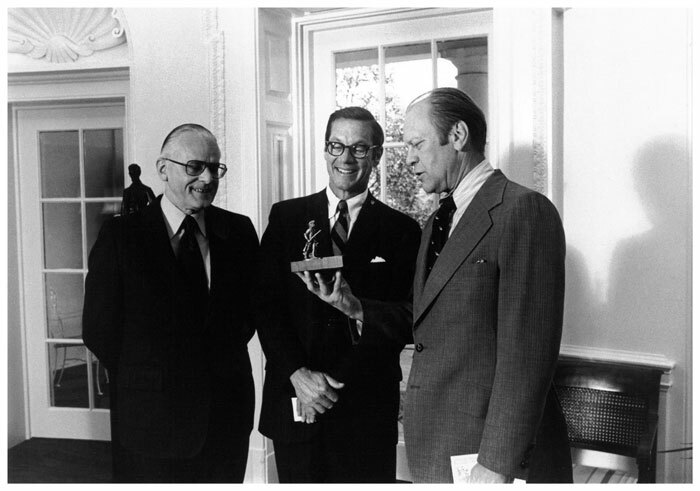 The next day, when it became available to the public, he purchased the first such bond from Treasury Secretary Henry Morgenthau. 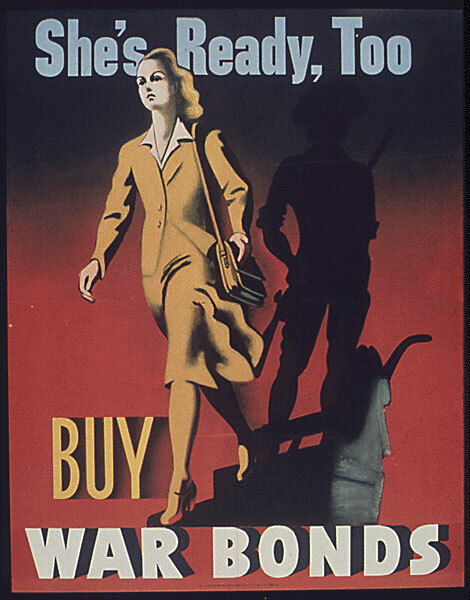 Following the attack on Pearl Harbor, Defense Bonds became known as War Savings Bonds, or informally as War Bonds. War Stamps were also introduced in small denominations (10¢, 25¢, 50¢, $1, $5) so any citizen could support the war for as little as one dime. The "Minute Man of Concord" sculpture, by David Chester French, was chosen as a symbol of the U.S. Savings Bonds Program. 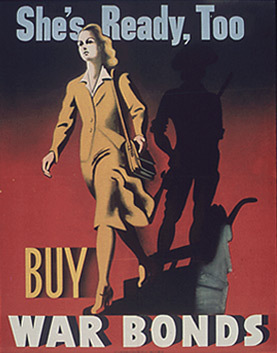 To help finance the war, the Treasury Department developed a number of initiatives targeting different audiences including American workers, women, and farmers. 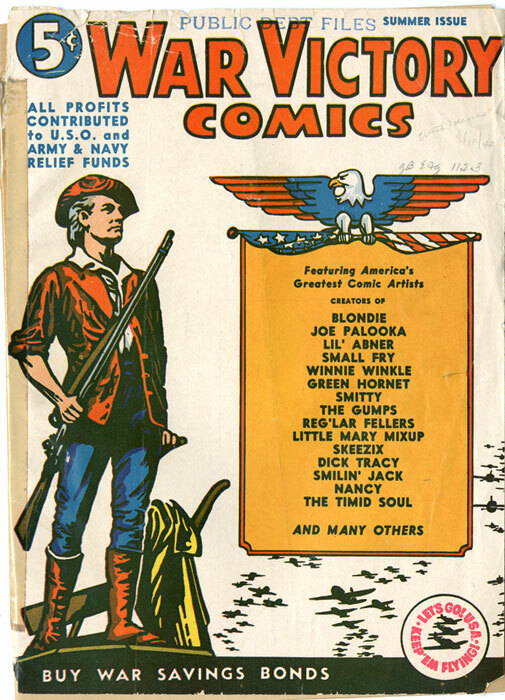 Additionally, the Treasury Department approved the use of a payroll deduction plan for the purchase of War Bonds. This later became known as the Payroll Savings Plan, and is still available electronically today. Artists, entertainers and schools pitched in to support the bond effort. 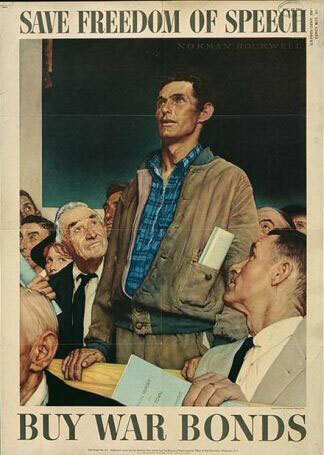 Norman Rockwell's "Four Freedoms" paintings — originally published in The Saturday Evening Post — were taken on a nationwide department store tour, raising $130 million in War Bond sales. Occasionally, movie premieres offered admission with the purchase of a bond, while star-studded parades and touring shows entertained audiences and promoted bonds. The Hollywood Bond Cavalcade, for example, was a traveling variety show featuring the likes of Lucille Ball, Judy Garland and Mickey Rooney. Even schools got behind the bond effort, purchasing 90,000 Jeeps through bond and stamp purchases as part of the "Schools at War" program. Savings bonds evolved into a popular way for families to build their nest egg. By 1945 and 1946, more Americans bought savings bonds than cashed them. Surveys at the time indicated many people resisted cashing their bonds to allow the savings to grow. H Bonds offered a current income bond that paid interest every six months — and earned interest for 30 years. They were replaced by Series HH Savings Bonds in January 1980. President John F. Kennedy encouraged Americans to purchase U.S. Savings Bonds. His administration established the U.S. Industrial Payroll Savings Committee, an organization of top business leaders aimed at spearheading payroll savings campaigns in American industry. 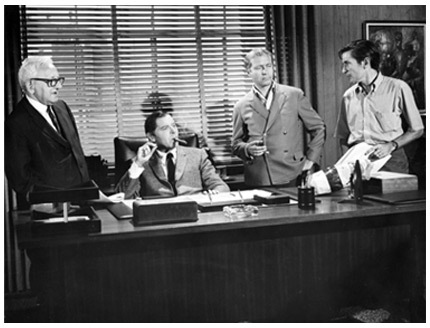 Its first campaign, staged in 1963, stimulated the largest enrollment of new payroll savers since World War II. President Kennedy met and thanked the Committee in the Rose Garden of the White House on November 5, 1963 – just 17 days before his assassination. 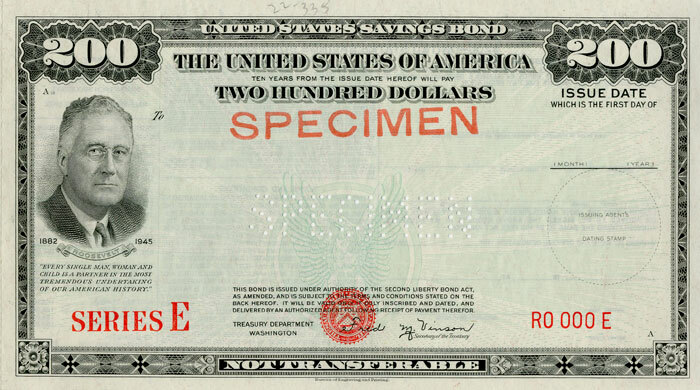 The 25th anniversary of the Series E Savings Bond in 1966 saluted the broadcasting industry for the millions of promotional words (and musical notes) it had contributed to bond sales since 1941. The Treasury Department, in collaboration with the motion picture industry, produced a short film titled “The Land We Love” that tied the nation's history and geography to the savings bond tradition. 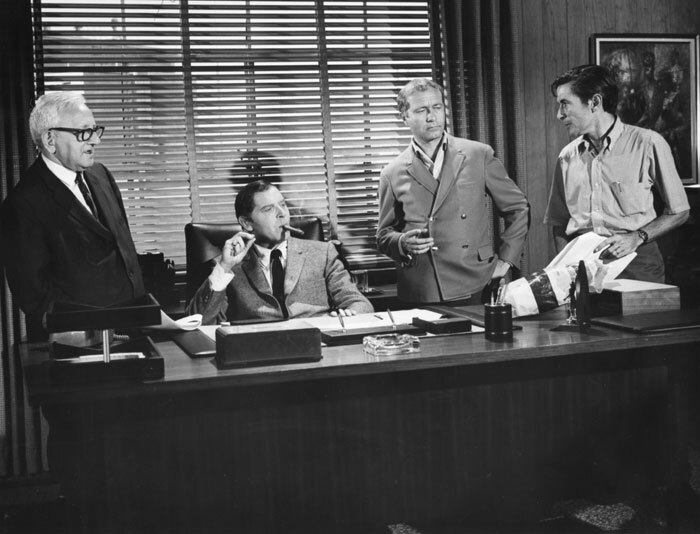 A second film, the “Star Spangled Salesman,” was produced two years later and featured stars such as Carol Burnett, Milton Berle, Howard Morris and The Three Stooges. 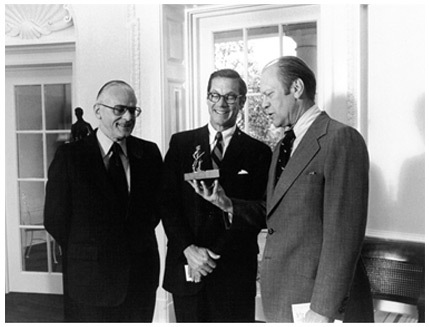 President Ford was a strong supporter of the U.S. Savings Bonds Program. 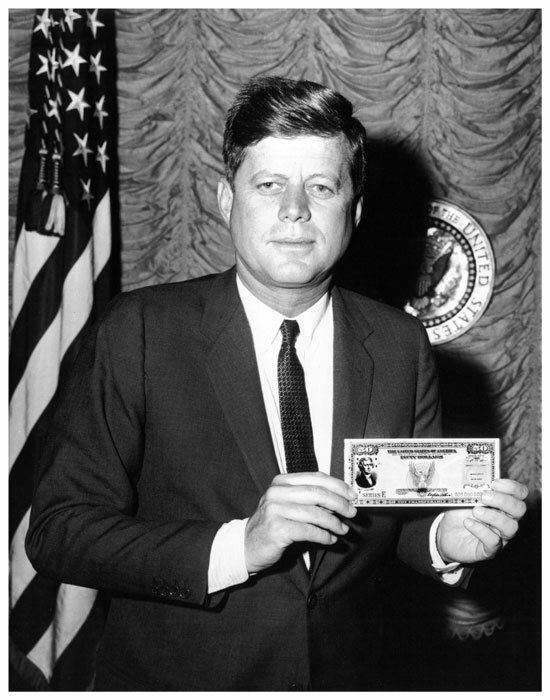 During his presidency, the nation's 200th birthday coincided with the 35th anniversary of the U.S. Savings Bonds Program. The film "An American Partnership" celebrated the Bicentennial and highlighted a yearlong campaign honoring the role of citizens in financing the nation's growth. The 1980s continued to promote savings bonds through pop culture references. The decade started with the introduction of Series EE and HH Bonds. Later, “Cheers” television show characters made witty references to savings bonds, and famed race car driver Aloysius (Cappy) Coleman Jr. took the wheel of the official U.S. Savings Bonds race car. The car made its debut in 1989 at the Charlotte Motor Speedway in North Carolina. To help Americans finance their dream of a college education, Congress created the Education Savings Bond program. Under this program, Series EE Savings Bonds purchased by qualified taxpayers on or after January 1, 1990, are tax-free if used to pay tuition and fees at eligible educational institutions. 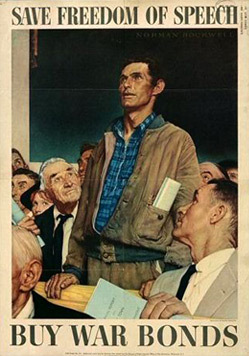 Fifty years after the introduction of the Series E Savings Bond, the Treasury Department launched a yearlong golden anniversary campaign, “Celebrate an American Tradition – 50 Years of U.S. Savings Bonds.” The campaign included public service announcements featuring Bugs Bunny as well as a publication of the history of the U.S. Savings Bond Program. The Treasury Department introduced the Series I Savings Bond to encourage more Americans to save for the future while protecting their savings against inflation. The new bond series, launched at an official ceremony led by Vice President Al Gore, is indexed to the Consumer Price Index in denominations as small as $50. 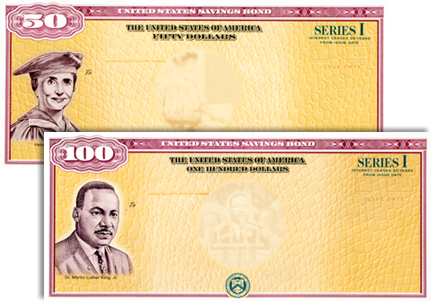 Artwork on the bonds feature eight historical figures from the late 19th and 20th centuries, including: Helen Keller, Dr. Martin Luther King Jr., Dr. Hector P. Garcia, Chief Joseph, Gen. George C. Marshall, Albert Einstein, Marian Anderson and Spark M. Matsunaga. 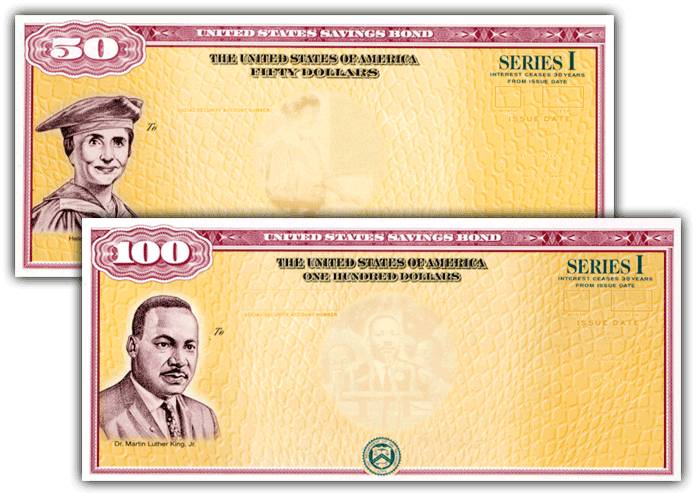 Series I Savings Bonds feature images of honored and distinguished Americans, such as Helen Keller and Dr. Martin Luther King, Jr. 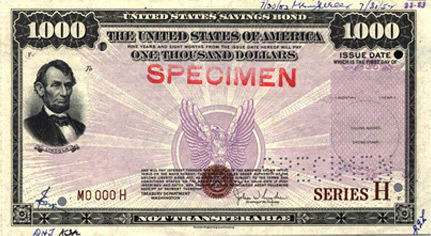 The U.S. Department of the Treasury's Bureau of the Public Debt first made digital Series I Savings Bonds available for purchase online in 2002. The digital Series EE Savings Bond soon followed. The TreasuryDirect.gov website was launched in 2004, offering Americans a one-stop shop for purchasing and redeeming savings bonds and other Treasury securities online. 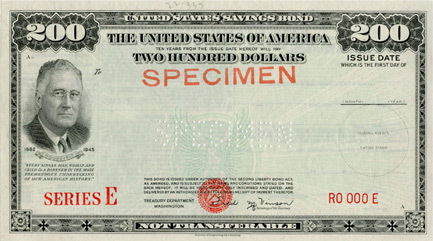 As of January 1, 2012, paper savings bonds are no longer being sold over the counter at banks and other financial institutions. Instead, Americans can continue to buy savings bonds online from the convenience of home through TreasuryDirect.gov. Opening a TreasuryDirect account is free, and you can buy and manage your savings bonds online, anytime – 24 hours a day, 7 days a week. 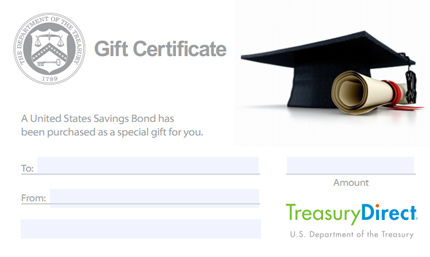 You can also purchase online savings bonds as gifts – TreasuryDirect offers a variety of gift certificates for any occasion. Visit TreasuryDirect.gov for more information. As of 2012, U.S. Savings Bonds go digital. Learn More.